We’d already seen glimpses of Google’s plans for RCS messaging in Android, thanks to the latest Android Messages app. Now, according to a blog post from Google, the company is bringing this feature to businesses in the US in a bid to replace SMS with RCS, or Rich Communication Services. RCS is a GSM standard and, offers richer content and a more interactive interface than the older SMS technology. 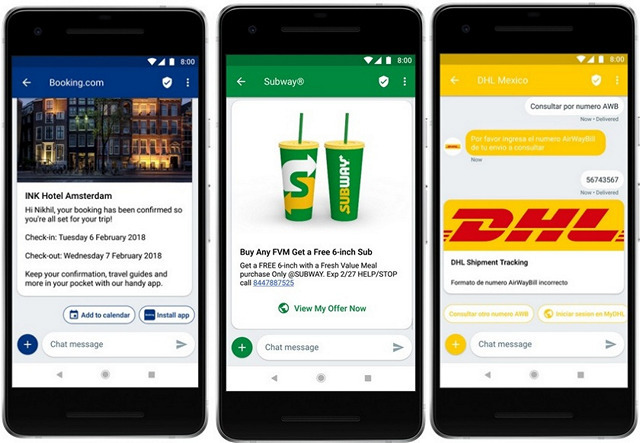 As part of Google’s push to popularize the new platform, it has been working with many businesses in the US and Mexico to adopt the new standard that will allow them to offer branding, rich media, interactivity and analytics to their consumers who use the ‘Android Messages‘ app on their smartphone. Google says that Sprint, Subway, SnapTravel, 1-800 Contacts, 1-800-Flowers.com and Booking.com will be among the first companies in the U.S. to adopt the new standard. Messaging partners will include 3C, CM.com, Mobivity, OpenMarket, Smooch and Twilio. The company is also planning a launch in Mexico, and towards that end, is working with 5 Piso, Broxel, DHL Mexico and Secretaria de Salud to start the campaign with Telcel. Messaging partners in the country will include Airmovil, Auronix, Aldeamo and Tiaxawith. The feature will be rolled out to more regions in the coming months, with 43 carriers and device manufacturers from around the world said to be working on RCS as we speak. Between them, they have about 1.8 billion customers and subscribers worldwide. According to Google, OEMs that have agreed to pre-load Android Messages on their devices include TCL/Alcatel/Blackberry, Transsion, BLU, Positivo, Multilaser, Mobiwire, Azumi and Essential. The company also doesn’t expect any problems on the inter-operability front, saying that, “all carriers are committed to interconnecting through the Jibe RCS Hub to bring RCS messaging to users across networks”. “Over the past year, carriers across Europe, North America and Latin America including America Movil, AT&T in Mexico, Celcom Axiata Berhad, Freedom Mobile, Oi, Telia Company and Telefonica joined Deutsche Telekom, Globe Telecom, Orange, Rogers Communications, Sprint and Telenor Group in their commitment to launch RCS messaging, powered by the Jibe RCS cloud from Google”. While iPhone users continue to swear by iMessage, Android users have long stopped using the default messaging apps that come with their devices That’s got a lot to do with the emergence of OTT messaging apps, such as WhatsApp, Facebook Messenger and others that offer so much more functionality than SMS ever did. However, even as end-consumers have moved on from SMSes, businesses continue to communicate with their users via SMS, which is where Google’s latest announcement assumes significance.